Alumnus Matteo Mischiati (EE Ph.D. 2011), is the principal author of “Internal models direct dragonfly interception steering,” published in the Dec. 10, 2014 issue of the journal Nature. Mischiati is a postdoctoral associate in the Leonardo Lab at the Howard Hughes Medical Institute’s (HHMI) Janelia Research Campus in Ashburn, Va. At Maryland he was advised by Professor P. S. Krishnaprasad (ECE/ISR). The research was conducted in the Leonardo lab by a team that included Huai-Ti Lin, Paul Herold, and Anthony Leonardo of the Janelia Research Campus; Elliot Imler, University of Arizona; and Robert Olberg, Union College, Schenectady, N.Y.
Dragonflies are formidable predators that succeed in catching their prey about 95 percent of the time. Their strategy is to perch on vegetation, wait for prey to drift overhead, then quickly pursue it, snatching the prey in less than half a second. The researchers examined to what extent this prey interception requires the dragonfly to create internal models. It is well known that sensorimotor control in vertebrates relies on predictive models generated in the brain, but it has been unclear whether insects are capable of such strategies, or whether their movements are solely reaction-based. To figure out the answer, Mischiati and his colleagues performed extremely accurate, high-speed measurements of dragonfly head and body orientation relative to various prey positions using a sophisticated “flight arena” they built to provide a controlled, indoor setting. Because dragonflies typically refuse to chase prey under artificial conditions, the flight arena included backdrops of natural scenery and lighting that simulated a bright, sunlit day. They outfitted the dragonflies with retroreflective markers that, in combination with high-speed cameras, could measure the orientation of the dragonfly’s head and body during flight. They recorded dragonflies' movements as they chased after either a fruit fly or an artificial prey on a wire, and calculated how the image of the prey moved across the dragonfly's eyes, as the result of the movements of both parties. When the research team analyzed the videos, it was clear that the dragonflies were not simply responding to the movements of the prey. Instead, they made structured turns that adjusted the orientation of their bodies—even when the prey's trajectory did not change. Mischiati learned that predictive rotations of the dragonfly’s head continuously track the prey’s angular position. The head-body angles established by prey tracking appear to guide systematic rotations of the dragonfly’s body to align it with the prey’s flight path. Rather than adjusting head position after the prey image drifts outside the visual acute zone, dragonflies adjust their head positions in near-perfect synchrony with the motions that would cause image drift. This precise timing led the research team to determine that dragonflies must be generating predictions using internal models of how prey- and self-motion will affect the location of the prey image on their eyes, and moving their heads to compensate before image drift occurs. Mischiati and his colleagues concluded dragonflies employ both predictive and reactive control, combining forward, inverse and target models with visual feedback to solve complex motor control problems, and are capable of displaying considerable computational sophistication and planning their behavior. 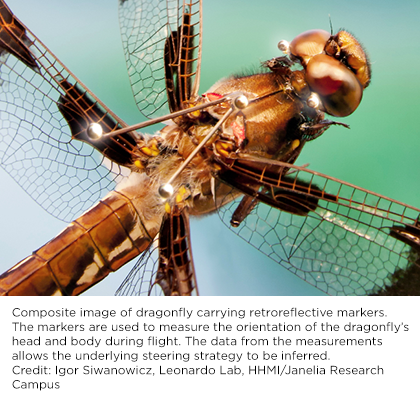 Model-driven control apparently underlies the bulk of a dragonfly’s interception steering, while its vision is used for reactions to unexpected prey movements. The majority of dragonfly maneuvers are not associated with any change in prey motion. This type of predictive control confers an advantage when compared to a purely reactive strategy. Dragonflies employ both predictive and reactive control, combining forward, inverse and target models with visual feedback to solve complex motor control problems, and are capable of displaying considerable computational sophistication and planning their behavior.